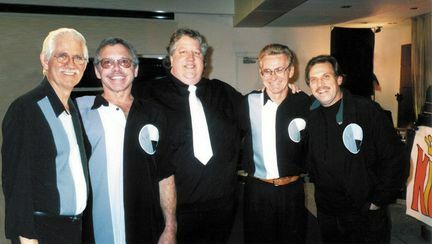 The Kingtones, featuring keyboard player Bruce Snoap, left, in 2007. The Kingtones, a pop-flavored rock band which became one of the Grand Rapids area's most popular performing acts in the 1960s, led all voting online for this year's induction into the Michigan Rock and Roll Legends. Grand Rapids' "original garage band" became the first of six acts from the Great Lakes State to earn induction over the weekend into the online hall of fame, founded in 2005 by rock historian and devotee Gary "Dr. J" Johnson of Essexville. Four other bands -- Hank Ballard & the Midnighters (Detroit), The Funk Brothers (Detroit), The Rationals (Detroit/Ann Arbor), SCR (Detroit/Ann Arbor) -- rounded out the top five in earning entry as Legends, along with honorary induction of Motown's famous songwriting team of Holland-Dozier-Holland. They join 42 others previously inducted into the hall, distinguished company that includes Bob Seger, Del Shannon, Aretha Franklin, The Four Tops, Ted Nugent, Stevie Wonder, Alice Cooper and others with a Michigan connection. "The Kingtones feel truly honored," acknowledged keyboard player Bruce Snoap of Grand Rapids, who along with guitarist Phil Roberts, are the longest-serving members of the band that scored its first regional hit "Wish for an Angel" in 1961. "To be voted into the Michigan Rock and Roll Legends by our fans is one of the highlights of The Kingtones' 50 years of service. We loved playing music and entertaining people. (It) makes us feel humble and blessed." Fans obviously responded because The Kingtones led the way in 2010 by being named on nearly 32 percent of online ballots submitted by voters. Hank Ballard came in second by being selected on 29.7 percent of ballots. A few significant others fell just short of induction this year, including The Eschelons (from Grand Rapids), Frijid Pink, The Romantics, Edwin Starr, Barbara Lewis, Suzie Quatro and Marshall Crenshaw. Johnson called The Kingtones' first-place finish "somewhat of a surprise," with Snoap suggesting a recent "Sound Check" blog item about the band's nomination helped get the word out. Johnson's website also added 10 Michigan songs to its "legendary" list: "Mystery Man" by The Frost, "Shotgun" by Jr. Walker & The All Stars, "Against The Wind" by Bob Seger & The Silver Bullet Band, "Superstition" by Stevie Wonder, "In The Midnight Hour" by Wilson Pickett, "Crimson & Clover" by Tommy James & The Shondells, "Please Mr. Postman" by The Marvelettes, "Heat Wave" by Martha & The Vandellas, "Chain Of Fools" by Aretha Franklin, and "The Way I Walk" by Jack Scott. Classic tunes all and deserving of legendary status, I must say.